Elyse Levesque's Official Website and Twitter @AtLeastLevesque and Rap Group Videos. Canadian-born Elyse Levesque is a down to earth stunning beauty who you'll recognize from TV's Stargate Universe and Cedar Grove. She currently took on the Producer's hat and is working on a short film called Fruitcake. Your full name is Elyse Marie Levesque. Are you named after anyone? I'm actually named after the mom in Family Ties! And "Levesque" is a very popular French Canadian last name. You recently started producing a short film called "Fruitcake". Tell us about that. Why did you decide to get into producing? "Fruitcake" is a short film inspired by a story my friend and co-producer Erin Boyes heard about while she was studying psychology. We've changed the story to focus more on our two leading ladies, but the idea originated from a doctor named Walter Freeman who popularized the icepick lobotomy in the late 40s, early 50s! I decided to get into producing to learn more about the other side of this business and to be able to have greater input on a project. It's by no means easy; turns out hounding people for money can be somewhat awkward...but that being said, I am learning a lot and having fun in the process. I am certainly not opposed to doing more producing down the line, but my heart is and probably always will be with acting! Describe your daily workout and diet. Daily...maybe not so much, but I do try to do yoga at least three times a week. When the weather isn't too unbearably hot I try to throw a hike in there or some sort of outdoor activity! Growing up I was a very active kid playing softball, track & field and dancing. I try to eat healthy. There is an abundance of kale in my life. But I also love cheese. Everything in moderation is my motto. You started acting as a child. How have you grown as an actor over the years? I would like to think that, yes, I have grown as an actor over the years. I think it's likely that if you are open to growth in your life that it will inevitably factor into your art. How do you get people to look past your looks and concentrate on your acting ability and singing? Haha! Well thank you for the flattery, you know how to make a girl feel good!! You know, the unfortunate truth is that so much of this industry is based on looks and not always on talent. I make sure to keep studying and concentrating on the work itself in order to not get swept up in all that nonsense. People are going to see what they want to see, regardless of how hard you try to show them otherwise so it's important to keep your integrity as an artist separate from the aesthetic demands of this business. Do you currently reside in L.A.? Why'd you make the move from Canada to L.A.? Is there a different "feel" between Canada and L.A.? I do currently reside in L.A. And have been splitting my time between here and Vancouver for the past two years. I decided to make the move down here to take my work to the next level and to be faced with new challenges in my career. My family is all back in Saskatchewan, that includes my dog, Aspen. He's the silliest dog that ever was, but I love him oh so much! I'd say the hardest part about living in L.A. is being so far away from some of my closest friends and family. There is a definite difference or "feel" to this town compared to back home. It moves at a rapid pace and is much more aggressive than what we are used to in Canada. You have perfect teeth. Did you have braces? I just recently did Invisalign to straighten my bottom chompers! And a little known fact, my top front teeth are fake as I lost them in grade seven during a game of dodge ball. So thank god for technology or my mouth would be a hot mess. "This is where the rap group all began. 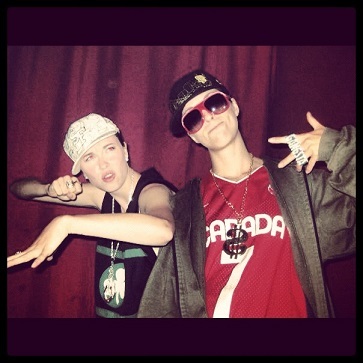 Me and my bestie Devon being gangstas!!" You're 1/3 of a female rap group. How'd you get started in rap? Who writes the songs and edits the videos? The other 2/3s consist of a Miss Devon Weigel and a Madame Leah Gauthier. They're two of my besties and we all used to live together a few years back. The rap thing was a gradual inspiration...it started with me doing a rap performance in one of my acting classes. That's where it began for me anyway. I roped Devon into performing with me at an event, which Leah came to see and then a few years later the band was formed. We have a friend of ours who makes us a "beat", but we write and perform the lyrics. We've had a few different people direct and edit, but now Devon does our editing. Have you ever had any broken bones? Knock on wood, as I have yet to break any bones. But like I said earlier, I chipped more than half of my three front teeth when I went head first into a wall during gym class. So I guess that counts? What's your experience been with attending sci-fi conventions? Have you ever been to conventions as a spectator, not as a hired actor? I've had some wonderful experiences attending conventions. In fact, I just did one in the U.K. and had the best time ever!! One of the great things about sci-fi is its devoted fans. Not a lot of genres get that kind of lifelong following. It's amazing because quite often the fans know more about your show and even your character than you do! I have yet to go to a convention just as a spectator, but I think I would have a blast as sci-fi fans know how to have a good time! I am a product junkie. But I'd say my biggest beauty secret is the hydra-facial. Am absolutely obsessed with this treatment. As far as creams and what not, I use a lot of Clinique and Fresh products. Love love love the Fresh brown sugar face scrub. As for makeup I use the Laura Mercier tinted moisturizer for my foundation and concealer. If you want to be inspired go see Cate Blanchett in "Blue Jasmine". That is all.